Stephanie Rochefort | Communications professional and left-handed lover of learning, social media, weight lifting, and cats. Communications professional and left-handed lover of learning, social media, weight lifting, and cats. What do you eat to lose weight? In June 2013, I set a goal to lose 60 lbs. 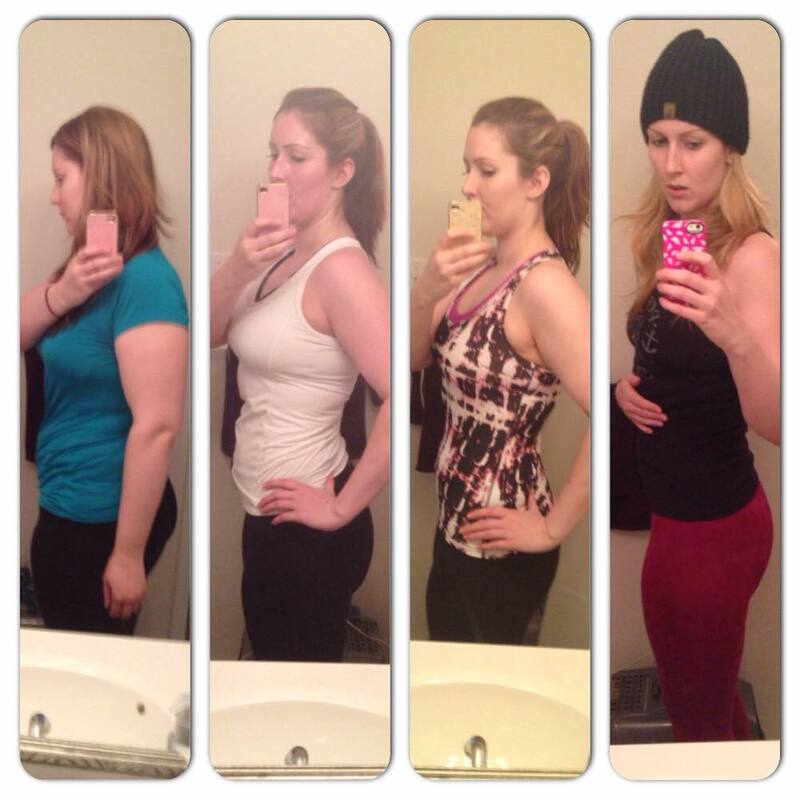 On December 13, 2014, 19 months into my fitness journey, I reached that goal. It was exciting but bittersweet. I had come so far, but was still not physically where I wanted to be. I think I still have another 15 lbs to lose before I will look pretty lean, but I am not focused on the number on the scale. The weight comes off much slower these days, and I am more concerned about how my body feels and looks, and how clothes fit. 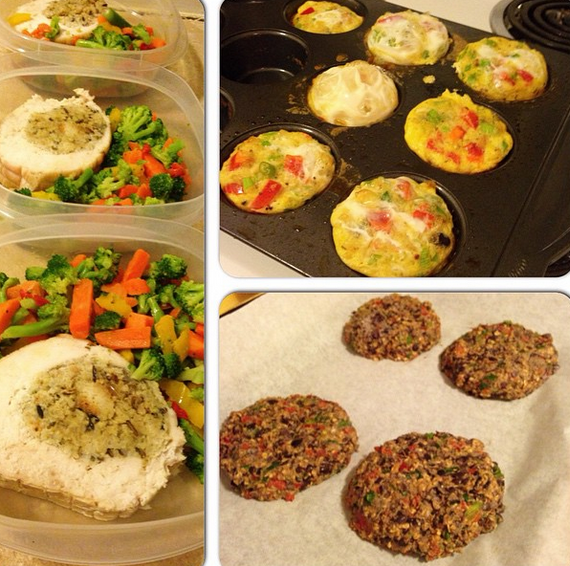 I prep most of my meals for the week on Sunday (breakfast, lunch, and snacks), and although I eat the same things for the week, I try to change it up every few weeks to keep it interesting. Here are some meals and snacks I’ve been enjoying recently. 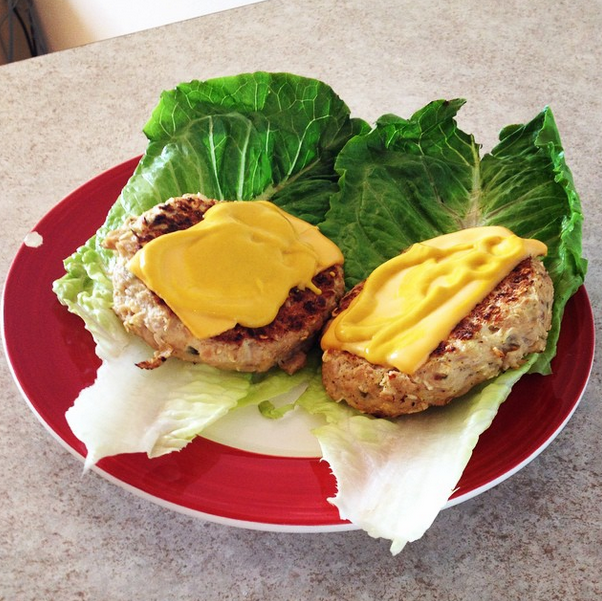 These tuna burgers are cheap, quick to make, and delicious! All you need is a can of tuna, a tablespoon of mayo, some spices (I like Mrs. Dash), quick oats, and an egg. I throw a slice of fat-free cheese and mustard on top and chow down. 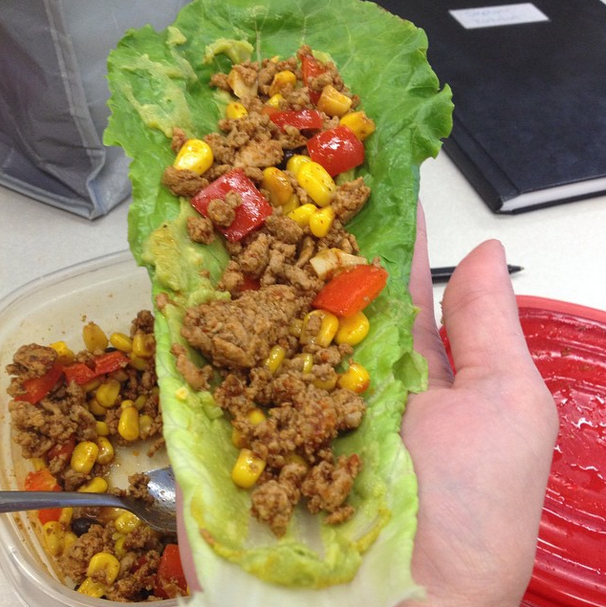 I really enjoy taco turkey anything, and these lettuce wraps make a great lunch. I brown a pound of ground turkey in a pan, add a packet of low-sodium taco seasoning, and throw in some corn, black beans, red peppers, onions, or whatever vegetables I have on hand. When I’m at work, I spread some guacamole on a romaine lettuce leaf and then top it with the mixture. I always get comments in the kitchen on how good my lunch smells when I’m heating this mixture up. If you’re not into lettuce wraps, you could use tortillas. Bananas and peanut butter are two of my favourite smoothie ingredients (with almond milk and chocolate protein powder), so I also love them as a snack on their own. 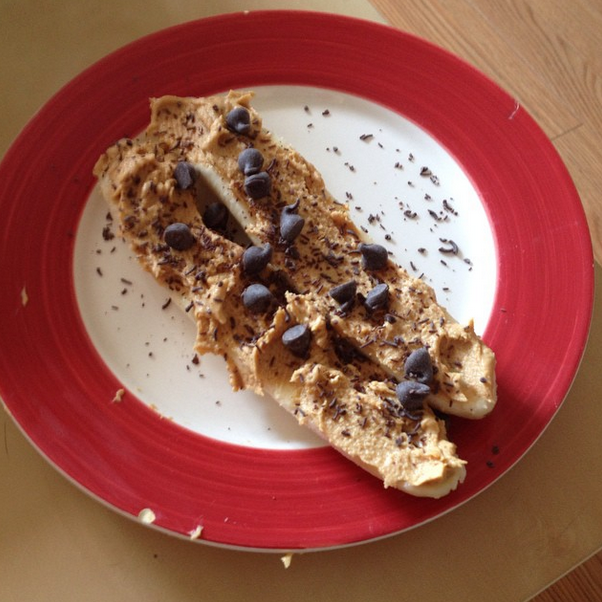 To make this low-calorie, I use PB2 (powdered peanut butter) instead of regular peanut butter. If you’re a big PB lover like I am, this stuff will change your life. The chocolate version is also pretty delicious. If you have a sweet tooth, sprinkle a few semi-sweet chocolate chips on top for a tasty treat. I have lost another 11 pounds since my last blog post, which means I am 9 lbs away from my initial goal weight! I try not to focus on what the scale too much these days, because I am happy if I see more muscle definition or lose a pant size. I still focus on lifting weights, and I have worked my entire body out a few times a week since my weight loss journey began. I have decided to split my routine into upper and lower body days so I can increase the intensity of my workouts and train more muscle groups. Other than that, I am still counting calories using MyFitnessPal (although it has been very challenging this summer! ), meal prepping, and generally watching what I eat. I have a little bit of abdominal definition happening, and I’m on a mission to see abs by Christmas. Wish me luck! 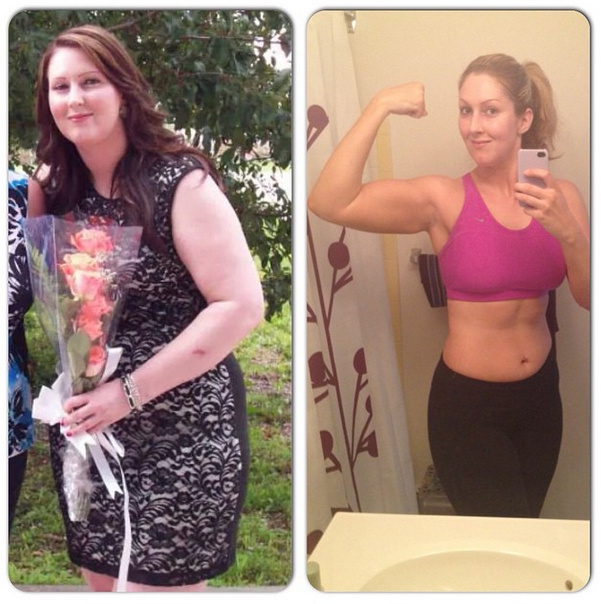 Left: June 2013, 224 lbs. Right: August 2014, 173 lbs. This is the first Essie polish I ever purchased! The colour is a beautiful sea foam green/turquoise which Essie describes as “a flirty and pretty tropical aqua.” But don’t be fooled by its beauty – this polish applies like a beast. It’s patchy, and takes around three coats to get full opacity (and still might be patchy). Do you feel like you have to sacrifice your workouts when you travel for work? Check out this video from Buff Dudes. I have to travel for a week this summer, so I will be trying some of these out to get in a few workouts while I’m away. No excuses! I was selected by Influenster to be part of the review process for L’Oreal’s new Damage Eraser hair care line. Influenster sent participants three small bottles of product labelled as L’Oreal shampoo, conditioner, and split end serum, and we were supposed to try and guess the L’Oreal brand before we received the full-size products a week later. My hair is already in pretty good shape, but I have been getting highlights for about a year, which can lead to some damage. After using the shampoo and conditioner, my hair is very soft, shiny, and doesn’t feel weighed down. I enjoy using them, and would repurchase if I saw them on sale at the drugstore. Garnier says these products are formulated for distressed, damaged hair, and they reconstruct and preserve hair’s strength by 90% from root to tip. The formula contains Phyto-Keratin® Complex with plant based protiens and fruit concentrate & Cupuaçu Butter, with natural lipids. I am a firm believer that you need to regularly get your hair trimmed to take care of split ends. Products may temporarily improve their appearance, but they won’t solve the problem. Garnier doesn’t say this fixes split ends, but says this product is formulated with Phyto-Keratin® complex and cupuaçu butter, and is supposed to prevent split ends and reconstruct and preserve hair’s strength.I don’t think this product makes a difference to my hair. I get my hair trimmed every few months to take care of my split ends, so I guess the only way for me to accurately test it would be to forgo a haircut (which isn’t going to happen). I will keep using this product until it runs out, but I probably will not repurchase. I like how soft my hair feels after using this treatment, and it also doesn’t weight my hair down. According to Garnier, this hair butter is formulated for distressed, damaged hair, and is designed to intensely reconstruct hair’s strength for strong, rejuvenated and shiny-looking hair. The formula contains Phyto-Keratin® Complex with plant based protiens and fruit concentrate & Cupuaçu Butter, with natural lipids. You are supposed to use it once a week after shampooing. My Address is Hollywood is a bright, rosy pink. This isn’t anything revolutionary, but it has a nice shimmer. I find the polish drags when I apply this colour, so I have to be a little more careful to get even coats. I really enjoy the Barthel Fitness YouTube channel. He has lots of great tips and I find him very motivational. As someone who doesn’t enjoy cardio and who focuses on lifting weights, this video makes sense to me. Check it out! It’s a little runny, and the first coat is very patchy, but a thicker, second coat does the trick. I receive many compliments on my nails from coworkers when I wear this shade. It’s bright, but if you can get away with it, why not be a little daring? 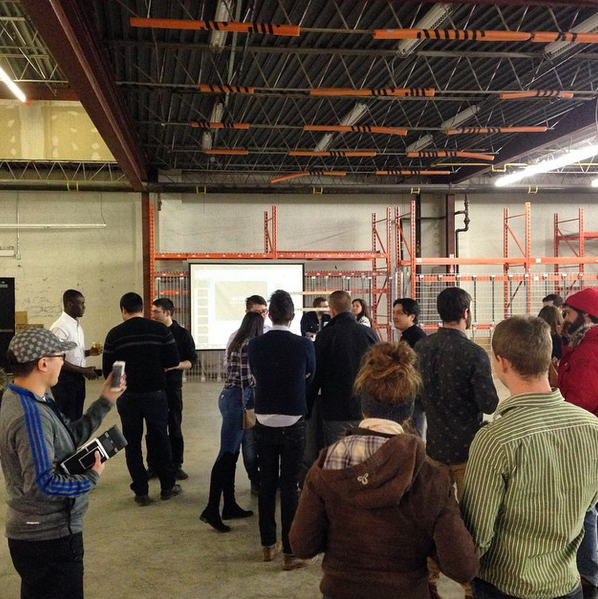 As you may know from a previous post, I was selected to be part of Virgin Mobile Canada’s Blackberry Z10 tester team (if you want to read about that, click here). I’ve been tweeting tips and tricks with the #vmtester hashtag, and have spent enough time with the phone to share some thoughts. Stephanie is a communications professional living in Ottawa, Ontario Canada. 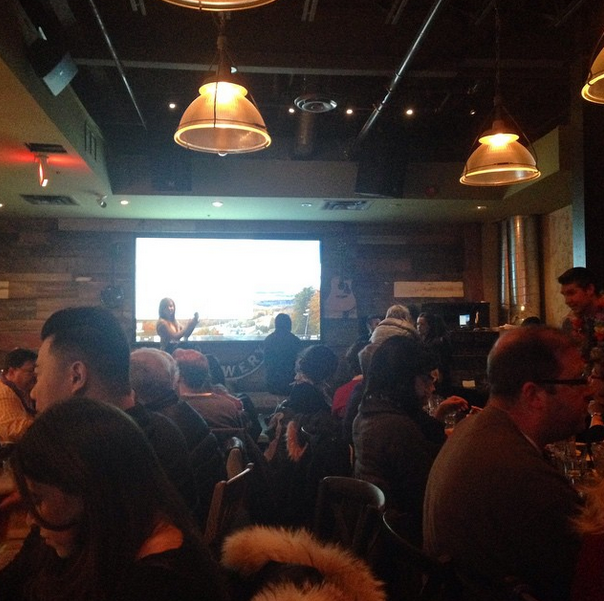 She works for the federal government and is the internal communications director on the Canadian Public Relation Society's Ottawa-Gatineau Chapter board of directors. She loves social media, fitness, cosmetics, and cats. Enter your email address to follow Stephanie and receive notifications of new posts by email.